Hi, what are you searching for? How important is flexibility when assessing your manufacturing ERP options and for remaining competitive? Acumatica’s new Whitepaper says it is top priority and explains why. According to the National Association of Manufacturers (NAM), manufacturers contributed $2.33 trillion to the U.S. economy in 2018’s first quarter and that most of the manufacturing firms in the U.S. have fewer than 500 employees (as of 2015). Obviously, SMB manufacturers pack a powerful punch, and Acumatica’s new Whitepaper, Manufacturing’s Competitive Needs and ERP Flexibility, highlights how their size fosters flexibility and how finding a manufacturing ERP that flexes with them provides a competitive edge. The Whitepaper is an invaluable resource for finding the right manufacturing software for the job, and Acumatica is offering it as a free download. Here’s an overview of what you’ll learn. Manufacturers of all sizes share many similarities. For example, they all share the end goal of producing profitable products using parts and materials from suppliers. They must oversee their inventories, sell their product, handle distribution, and manage financials. Manufacturing differences, however, revolve around the requirements that come with the specific product that is being produced and the volume of products being made. The Whitepaper describes in detail the Association for Supply Chain Management’s Volume-Variety Matrix, which explains the amount of support that is needed based on the “low volume/high variety, high volume/low variety” spectrum. Often, manufacturers are producing both types of volume and variety simultaneously. This flexibility within their operations translates into needing manufacturing software that can keep up. Another factor businesses need to consider when making their manufacturing ERP software selection is whether they produce “discrete” (hard goods manufacturing) or “process” (materials or products that pour) products. The Whitepaper is quick to point out, however, that lack of resources and the prohibitive cost of large ERP packages may hinder their ability to make the changes. Because of this, SMBs have had to rely on industry-specific solutions that limit their inherent flexibility, especially when market changes (e.g. shift to cloud technology) occur. This means they need to find manufacturing ERP software that can adapt to their needs and to changes dictated by the market. “Your ERP choice should be a long-term decision. The chosen system cannot be allowed to limit your company’s growth or expansion. Technology must be an enabler, not an impairment to your business,” the Whitepaper states. Whether you manufacture electrical equipment, automotive parts, food products, cosmetics, or anything in-between, you require a manufacturing ERP that can flex, function, and adapt with your manufacturing processes and requirements. The right manufacturing software increases efficiency and the ability to compete with larger manufacturers. As you consider your options, Acumatica invites you to check out Acumatica Manufacturing Edition. Acumatica Manufacturing Edition (enhanced in Acumatica 2019 R1) is a complete, multi-site cloud manufacturing control and planning system. It provides real-time coordination of your manufacturing activities (manufacturing, inventory, and accounting management) across the organization through seamless integration with Acumatica’s Distribution Management, Customer Management, Financial Management, and Project Accounting suites. The flexibility and usability you require is found in its make-to-stock, make-to-order, engineer-to-order, project centric, job shop, batch, and repetitive manufacturing functionality. Meeting your schedules and tracking your costs will never be easier. This is great news for SMB manufacturers. If you download Manufacturing’s Competitive Needs and ERP Flexibility, you’ll learn how flexible manufacturing ERP can encourage even more growth for your organization and how it can help you outperform the competition. Feel free to contact our team if you have questions about Acumatica’s award-winning cloud ERP solution and Acumatica Manufacturing Edition. Acumatica Manufacturing Edition a Foundation to Grow Our Business, Says Specified Technologies Inc.
Acumatica has an open platform, which was a huge selling point. The company looks for outside innovation and to work with as many ISV’s as possible to provide a multitude of solutions. We believe in that ethos because that’s how we operate. What is the ERP Implementation Process? ERP Implementation Life Cycle — What Is It? Get Acumatica Blog email updates as newsletters delivered bi-weekly to your inbox. Convenient! 1. We will never give your e-mail address to anyone else for any reason. 2. You can opt-out at any time. If you decide that you no longer want to receive a newsletter, you can unsubscribe by clicking the "Unsubscribe" link, located at the bottom of each newsletter. The Acumatica ERP (Enterprise Resource Planning) system delivers adaptable cloud and mobile technology with a unique, all-inclusive user licensing model. Acumatica provides a complete real-time view of your business anytime, anywhere, on any device. Through our worldwide network of partners, Acumatica ERP provides a full suite of integrated business management applications, including Financials, Distribution, Project Accounting, and CRM, as well as separate Field Service Edition, Commerce Edition, Manufacturing Edition, and Construction Edition. There is only one true Cloud ERP platform designed for mid-sized customers: Acumatica. If you would like us to get in touch with you, please let us know how we can reach you via this form. Fill out this form in order to receive our Acumatica Developer newsletter in your email inbox. 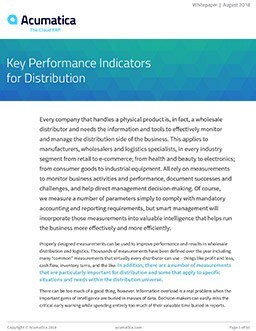 This expanded Gartner Market Guide helps manufacturers and distributors choose the right solution.